Spring or Autumn to enjoy the best weather without the crowds! We are comparing Nice City Sightseeing Small-Group Tour Prices from leading ticket suppliers and Try to find you Cheap tickets prices on the market. Nice is the glamourous capital city of the French Riviera located on the Mediterranean coast. Stunning picture-postcard scenery is all around but none more so than at Castle Hill where panoramic views show you the Alps as well as views across to St. Tropez. Castle Hill has history as well as views; this is the site Ancient Greeks set up a trading town some 2,500 years ago. The old town, known as Vieux Nice, is picturesque whilst Central Nice, the new town, has a trendy vibe full of fashion boutiques, streetside cafes, and top museums including the Modern Art Museum, Sosno's library and the Acropolis center. Meanwhile, the Cimiez neighborhood is very regal and upscale housing the Matisse Museum, the Chagall Museum, and Regina Palace, Queen Victoria's Winter home. and see the Regina. The city also has a Russian District that houses the largest Russian Orthodox church outside of Russia. An ideal way to become acquainted with the city of Nice as you learn about the sights you're passing and the history of the city. There is free time for you to look at the sights - This is not a traditional walking or bus tour - Your driver/guide tells you information as you travel between locations. Anyone who enjoys sightseeing and learning the history of the city they are visiting will enjoy this tour. Your Experience With Nice City Sightseeing Small-Group Tour? Your driver/guide will collect you from your central Nice hotel at the pre-arranged time. 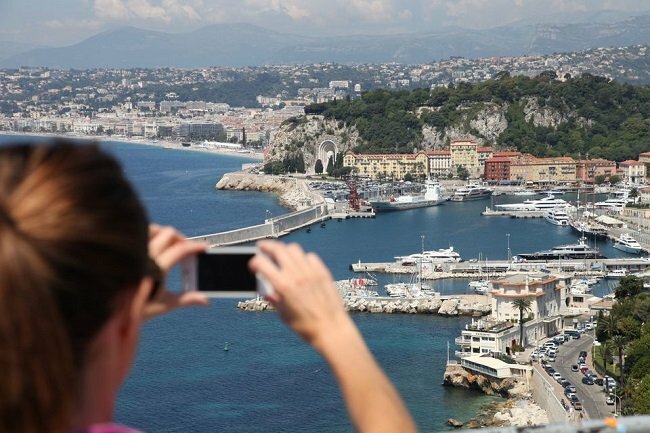 You will learn about the different areas of Nice from them as you make your way from one area to another by minibus with time to get out and explore on your own. You will be able to walk along the well-known and loved Promenade des Anglais, visit the flower market and the flea market in the old town. Pass by the fashion boutiques and pavement cafes in the hip area of central Nice. Enjoy the panoramic views from Castle Hill and admire the landscaped gardens and water fountain. You will then move on to the aristocratic Cimiez neighborhood with Regina Palace and the Matisse museum. Next you will have time to wander around the grounds of the Franciscan church and monastery before moving to the Russian District to see the Russian Orthodox Church. What Nice City Sightseeing Small-Group Tour Includes? Transport between areas with an air-conditioned minibus. Small group tours with a maximum of 8 other participants. A friendly and informative multilingual driver/guide. The Matisse Museum is closed on Tuesday's. Hotel collection is only included from Nice locations with the following postcodes/zipcodes: 06000, 06100, 06200 or 06300. Travelers Reviews about Nice City Sightseeing Small-Group Tour? Travellers talking about this tour on GetYourGuide, Viator, and TripAdvisor give it superb reviews for the most part. The vast majority of travellers say that their friendly and informative driver/guide were what made this trip special and they learned a great deal about the city in a fun way. People say that the trip is well organized with a good pace - about 20 minutes at each location, and the minibus comfortable. E-tickets and Printed tickets are both accepted. Check your email to ensure the trip is still taking place - Minimum numbers apply so the trip might be cancelled after confirmation is received. Collection from central Nice hotel or city center location.